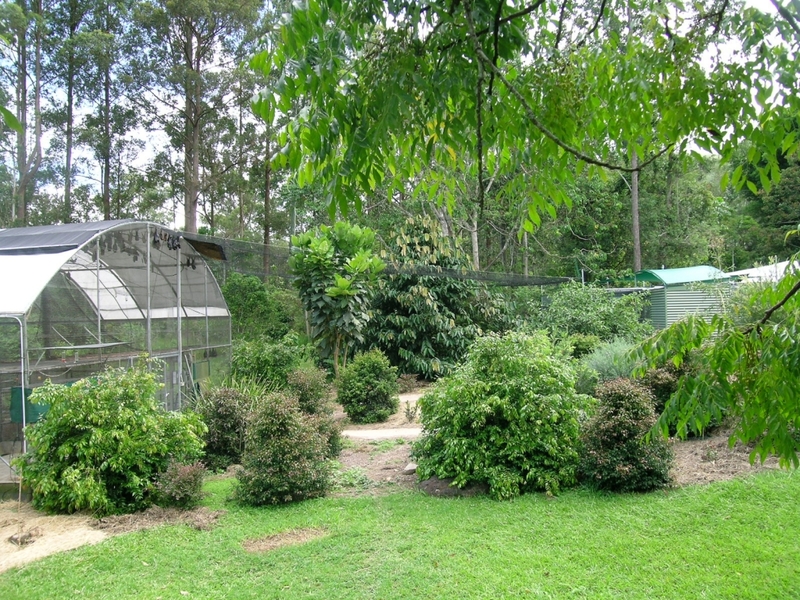 The large flight cage for flying foxes was built in 2003. It is 12 metres wide, 14.5 metres long, 3 metres high at the sides and 6 metres high in the middle. There are no internal posts. 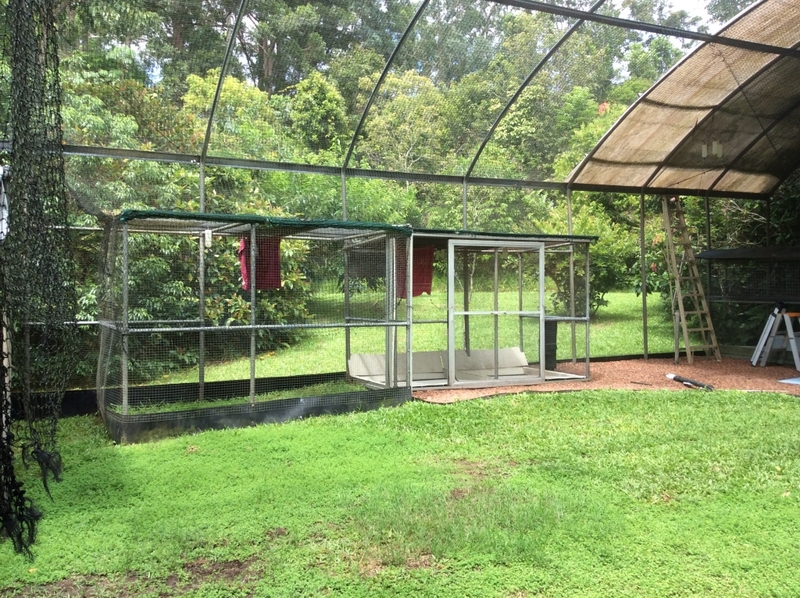 It has a waterproof cover and shade-cloth over 4.5 metres at one end where the Feeding cages are located. It is lined externally with galvanised wire mesh 25mm by 12mm, and internally with 25mm square netting. The netting is tensioned away from the wire, or hangs vertically down to provide a soft landing for the bats, protecting their wings from the harshness of the wire mesh. We squeegee all the waste off the floor and recycle it though large worm farms. Cages are then hosed. All the internal feeding cages, and the Orphan cage have gutters that gravity drain into a pump-well in the big cage. A cutter pump takes the waste water to a septic system. 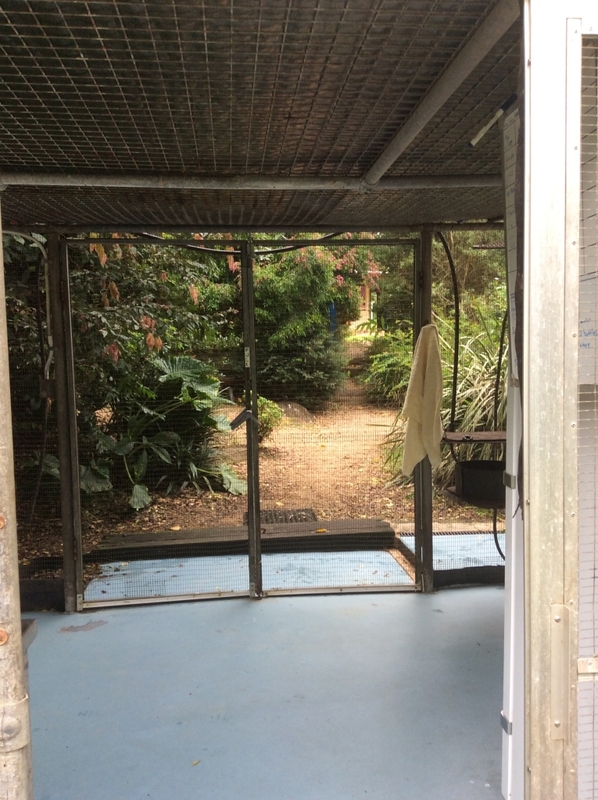 While it is possible to catch the bats in the 6 metre enclosure (see photo below), it is easier to wait until they come down for food. They enter the feeding area through a hatch. Attached to the hatch door is a rope that extends up to the house. When pulled, it closes the hatch door, trapping all those who are down feeding. Of course you do not always catch the particular bat you want! Bats that need ongoing care are kept down below in the Treatment cage. 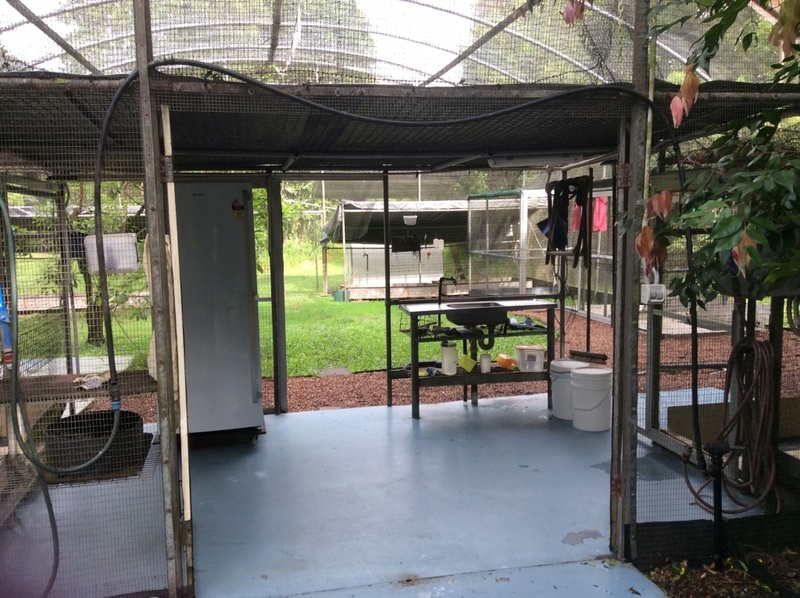 There are 2-metre-wide double doors at each short end of the cage, one leads into the Feeding area, the other to the cold room. 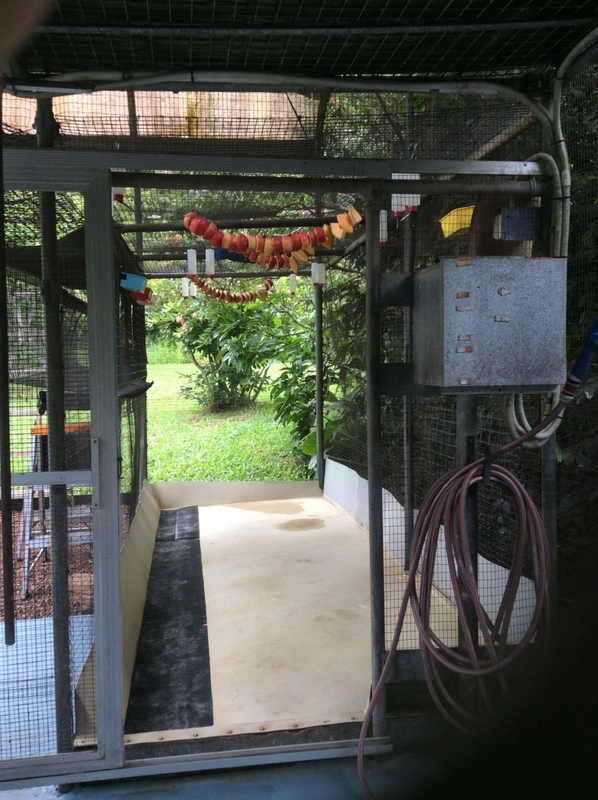 The Feeding area has a central ‘human area’ with a sink and refrigerator, and Feeding cages on either side. 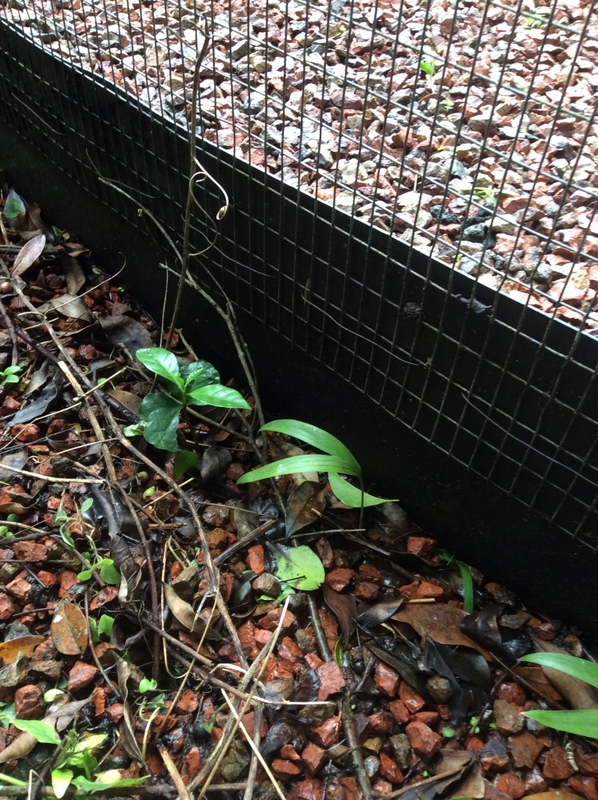 The main flight area of the cage has a thick bed of mulch/grass and a large fig tree. It is a sand-paper fig and so quite robust but the bats still manage to annihilate it. It is deciduous so usually bounces back to some extent. We have tried growing a range of trees in the cage but many failed as the leaves were either eaten by the bats (eg mulberry) or broken by the hundreds of orphans in there for a few months each year. In these 2 photos opposite you can just see the netting area (it’s black) outside the cage that extends across to Middle/Orphan cage. 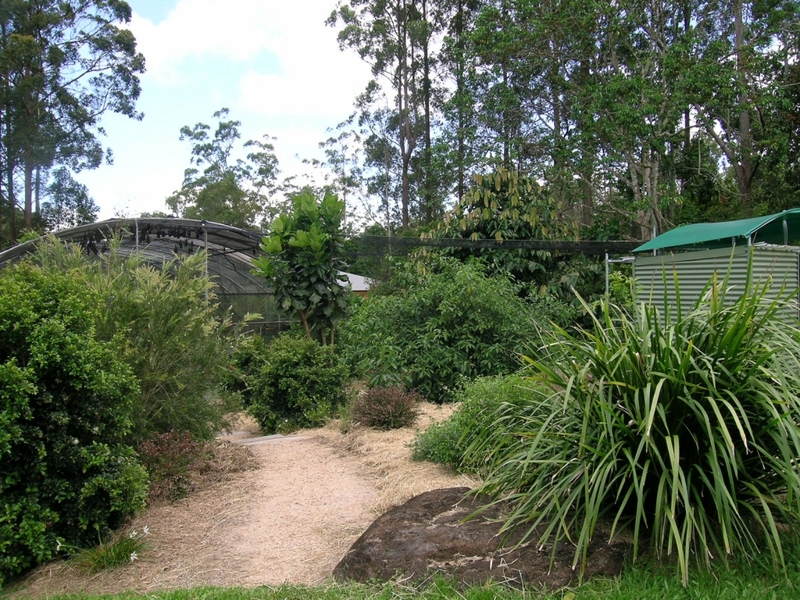 This allows unreleasable flying-foxes that live on the outside of the cage to move around from tree to tree. Two views of the large flight cage (above and below), taken in 2009. The trees have grown too much for any recent photos of the cage. The resident bats come down to the Feeding cages for food. They are very easy to clean, but still require a good scrub or pressure clean once a week, especially in wet weather. We find that using a vinegar wash after pressure-cleaning helps to prevent the scum layer building up again for a while. The floor area is heat welded 2 mm thick polypropylene sheeting that slopes down to a gutter. The gutter is heat welded to the floor, and takes the waste to a pumpwell, from which it is then pumped to a septic tank with soakage trenches. We cover the gutters with mats during feeding time so that food waste does not go into the gutter. Sand has been compacted underneath the floor area to establish the slope but rats can still make their way underneath, excavating as they go. It would have been better to add more cement to the sand during construction. We occasionally drill holes in the affected areas of the floor and pump in expansion foam, then heat-weld the hole to close it. This works well to make the floor feel solid again and prevents the rats extending their living quarters. We do our best to keep the cage rat-proof but still need to use racumin – an anticoagulant that is metabolised quickly so dead rodents carry very low residues, decreasing the risk of secondary poisoning to pets or wildlife who may scavenge on the dead rodents. 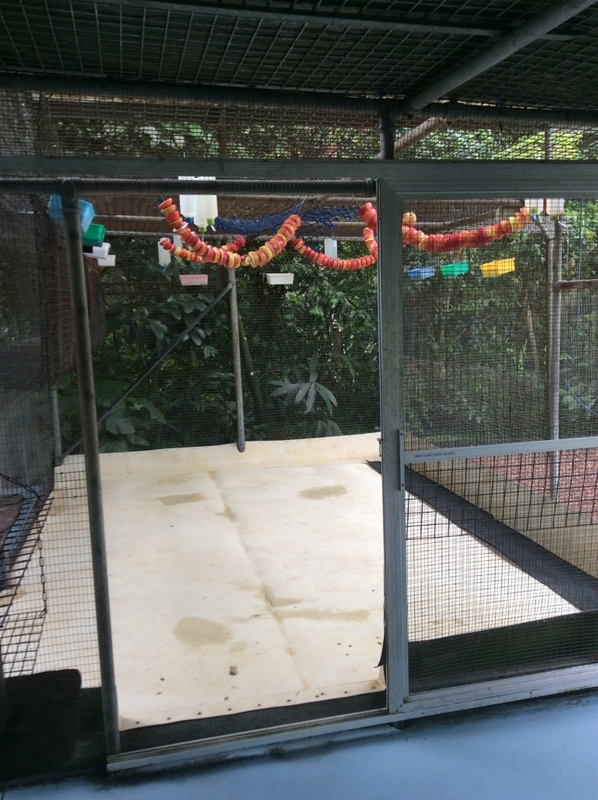 Photo below left: The Treatment cage is comprised of 3 sections. The far right is the Little Red feeding area, it has a small entry point that prevents the 3 larger species from entering. This allows them to get more of a nectar-based diet without competition. The middle and right sections share a sliding door. The middle and left sides are our Treatment cage – we call it Inside and Outside Treatment, with an opening in between that be open or closed. Most of the time the treatment bats are inside for eating and outside the rest of the time, but occasionally we have to keep the two areas separate and keep a second group in the Outside section. If we need to feed bats in the Outside section we have some thick corflute to catch the food waste rather than have the grass area deteriorate. There are ‘bedrooms’ within both Feeding cages that allow bats in care to socialise but not ‘escape’ up top, and we mainly use the separate Treatment cage that can house quite a number of treatment animals. We believe in the importance of allowing the bats to socialise while undergoing treatment. The 4 worm farms are old tea-drying containers from a local tea farm. 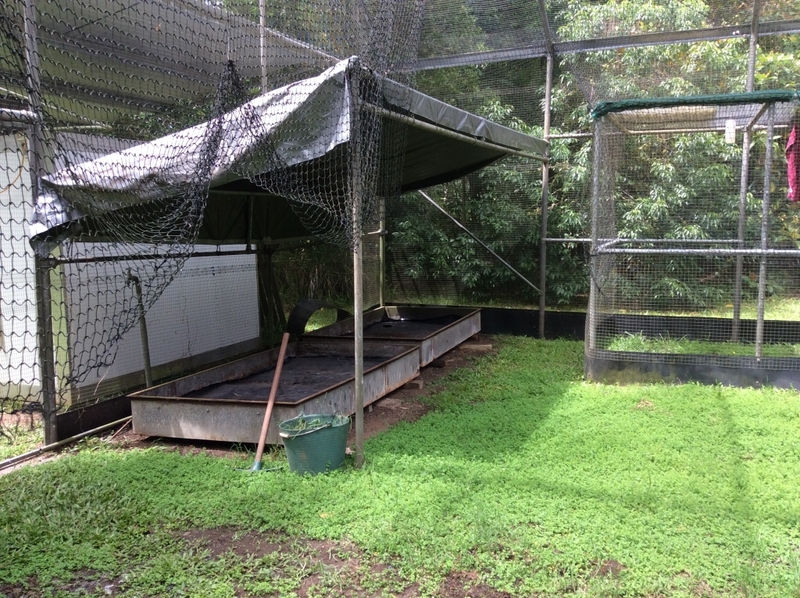 They have 50mm mesh floor topped with shade cloth and covered with black plastic to keep damp. 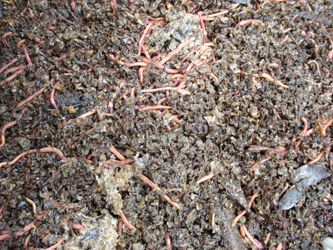 Worms turning the bat poo and spat into worm poo, which then goes on the garden. All our cages have 2mm polybelt or dam liner as a kind of rat wall around their circumference. It is cut to about 400mm wide, with 200-300mm vertically in the ground, the rest above ground. This allows easy attachment of wire mesh off the ground (no rusting), and an easy surface to brushcut the outside grass against (no damage to wire from brushcutter). Looking up to the house from the Human area inside the big cage. Detail showing how we join the polybelt to the cage walls. In the tropics the grass grows very quickly in the wet season. It’s very easy to brush-cut and mow along the edge of the cage that is lawn. 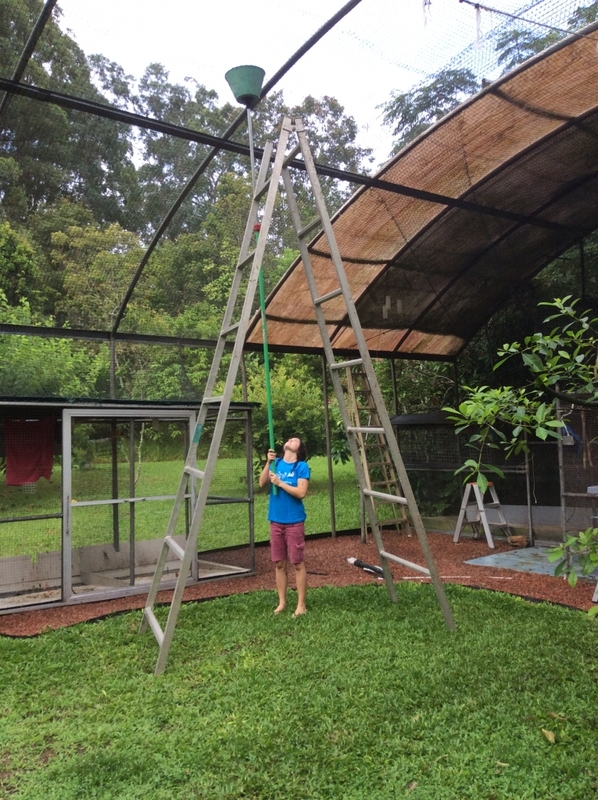 This how we catch bats in the big cage if we’re unsuccessful when they come down to eat. We capture them under the bucket and then go up the ladder to get them. Not easy if they can fly!